If you are ready to add timeless beauty to your Collingwood home by bringing a bathroom remodeling project through to completion, we want to work for you. Your bathroom should be a personal oasis you feel comfortable relaxing in. If you feel like your bathroom could use some updates, however, the cabinetry and woodworking solutions are a great place to start your bathroom remodeling project off with. Not only can new cabinetry add immense beauty to the bathroom in your Collingwood, Ontario home, but it can also increase the value of your property significantly. At McMillan Millwork & Joinery, our creative, client-oriented woodworking solutions bring exceptional design to life. Whatever your vision is, it is our job to understand what it is, put together customized plans, and execute these plans to produce a final product that goes well beyond your expectations. 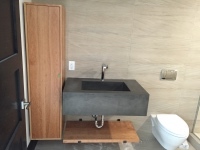 During your bathroom remodeling project, we can also work jointly with other renovation professionals you might have on your team to create a completely seamless finish. Although we work with homeowners on an individual basis, we also partner with contractors who need an expert eye on projects they take on. If you are a contractor, we will make sure our partnership is beneficial by making communication a priority and to producing quality work for you. If you are ready to add timeless beauty to your home by bringing a bathroom remodeling project through to completion, at McMillan Millwork & Joinery, we want to work for you. To find out more about our custom woodworking solutions, including cabinetry, please reach out to us today.